November is Augustinian Heritage Month here at Villanova and there are many events going on. One of the events is a marathon reading of Augustine’s Confessions, which began here in the library’s coffee shop at 9am this morning and will continue until about midnight. Stop by if you have the chance! But if you can’t make it, don’t worry! The Digital Library has launched an online exhibit of editions of the Confessions held in Special Collections. The exhibit is called “Tolle lege: The Confessions of St. Augustine”. Engraved title page from a 1646 edition. Editions are arranged by century, with items that are particularly noteworthy and/or available in the Digital Library getting their own sub-pages. 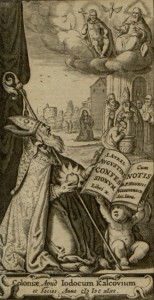 Each edition has at least one image associated with it and brief notes where applicable, creating a sort of visual bibliography of holdings of the Confessions in Special Collections. This is not a complete listing of our holdings, but additional items will be added over time, so be sure to check back.